Apple iPad mini 4 computer tablet was casually described by Apple as a little iPad Air 2, as its pack is similar, though their internal components are something different. The iPad mini 4 is the first major redesign of the iPad mini line, with a slightly taller and wider body compared to the iPad mini 2 and mini 3. The iPad mini 4 features the Apple A8 and the Apple M8 motion co-processor. Two iPad mini 4 models were designed by Apple: the Wi-Fi only model and a cellular-equipped model. According to Apple, itw CPU is 1.3 times faster, and its graphics performance is 1.6 times faster than those of the mini 2. Their other specifications, not related to this details, are identical. Compared to the previous versions of the iPad mini line, the iPad mini 4 has a better screen, better camera, faster processor and a Touch ID fingerprint sensor. This model can also handle split-screen apps, which can come in handy for checking email or Twitter while working. Processors: Dual core 1.5 GHz Apple A8 processor. Memory Storage: 16, 64, 128 GB of flash memory. Pre-Installed OS: iOS 9.0 (13A340). The iPad mini 4 is supported by the iOS 10 as well. Cameras: Dual cameras. Rear-mounted 8 megapixel iSight camera capable of shooting still images and 1080p video. Font-mounted 1.2 megapixel FaceTime HD camera capable of shooting still images and 720p video. Support: Mac Support: OS X 10.7.5. Windows Support: Windows 7. Connectivity and Networking: Dual-band 802.11a/b/g/n/ac Wi-Fi with HT80 with MIMO capability and Bluetooth 4.2. Connectivity to computers and power is provided by the Lightning port. USB Support: Sync and Charge. The Wi-Fi Only model does not support 4G LTE connectivity or A-GPS. Battery: Lythium polymer (19.1 whr). The battery life up to 10 hours surfing the web on Wi-Fi, watching video, or listening to music. Dimensions: 8.0 height x 5.3 width x 0.24 depth. Colors: Silver with a white front, gold with a white front, medium-toned space gray with a black front. The iPad Mini 4 ships with the iOS 9 pre-installed. This model was the first device to be equipped with iOS 9. With an additional 1 GB of RAM compared to the previous generations’ iPad mini, the iPad Mini 4 is capable of utilizing the Slide Over, Split View and Picture in Picture multitasking functions in iOS 9. This device is compatible with iOS 9.1, which was released on October 21, 2015, which adds additional features and some bug fixes. Apple announced iPad mini 4 was announced during the “Hey Siri” Apple Special Event on September 9, 2015, alongside other new or refreshed products, including the iPad Pro, the iPhone 6s and the Apple TV. Apple presented this version with only a brief mention at the end of the iPad Pro portion of the keynote. The iPad mini 4 does not offer a disk mode for file transfer. The third-party software is available. The device was the first major redesign of the iPad mini line, with a slightly taller and wider body (though with no increase in screen size) compared to the iPad mini 2 and mini 3. There is also a much thinner design, with the device mirroring the depth of the iPad Air 2. This device is also lighter than the previous generation by 33.2 grams. Due to the redesign, the iPad mini 4 is incompatible with cases that would otherwise work with the iPad Mini 2 or iPad Mini 3. To make up for this, Apple released a Smart Cover and Silicone Case for the Mini 4, which can be used separately or in conjunction to make a full protective case. Unlike the iPad Air 2, there is no leather Smart Case for the iPad mini 4. Reviews on the iPad mini 4 have generally been positive, with The Verge giving the iPad Mini 4 a 9/10, praising the display, fast performance, great camera, and multitasking but not liking the speaker or the chamfered edges. How to restore iPad mini. Get ready to sell your iPad online. 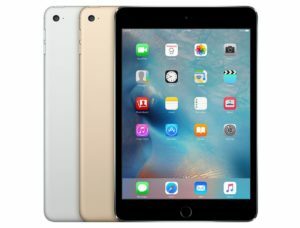 You can sell your old iPad mini 4 very fast and without efforts on this page: We buy iPad mini 4 for the best price online: Sell iPad mini 4 online now.